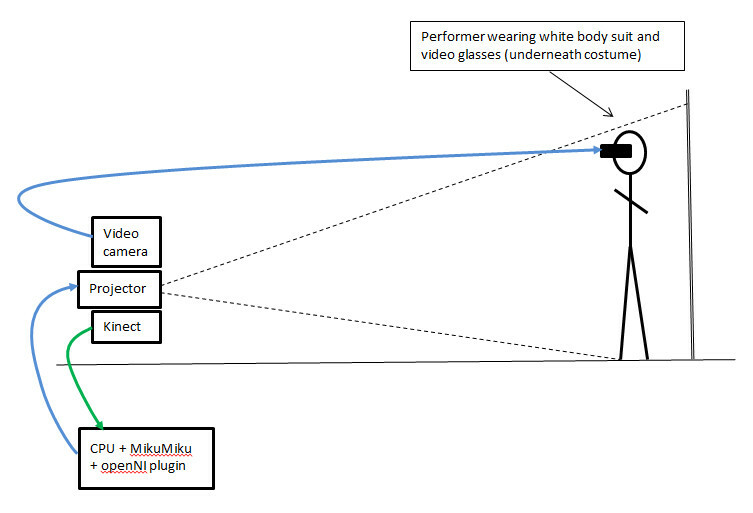 This is recording of an experimental live performance where a gesture responsive MikMiku Japanese animé dance figure is projected onto the body of the performer and at the same time the video of this projected body image is seen by the performer through a pair of video glasses. The resultant effect is that of a simultaneous Other and The Double – The Double resulting from the simultaneous co-existence of the male body superimposed and transformed by the projected female Other. The immersive effect of seeing the body transformed into a female Other had a strange uncanny effect on myself as the performer in that I began to play and adopt the movements and characteristics accorded to the projected Other. For example, the physical characteristics of the avatar’s long hair encouraged movements that resulted in greater expressions of flowing hair. The visual feedback of an alternative body through projection has a transforming effect on the performers behaviour, creating a sense of immersion into an “alter body”. The documentation is a recording and further tests need to be done to determine whether witnessing a live projection can convey the same sense of the uncanny. It has been pointed out that the video recording of a solitary act of performance constitutes an equally valid form of mediated performance and is associated with notions of voyeurism and secrecy that would not be present if performed live. It is envisaged that alternative avatars and backdrop scenes will be created using Unity 3D to explore the effects and potentials of other characterisations. These might include archetypes from Fairy Tales (old man, wizard, prince, old lady, witch, princess, monster) or classic gaming characters such as Lara Croft and the Prince of Persia. I5 Windows PC, video projector, video camera. Software: MikuMiku with OpenNI plugin.